As you know I've already got my favourite custom vert wheels (a sort of improved freespin that's convertible to an ultra-hard megavert without the need for tools or spare wheels) which I think Kain christened Freevertz. Only problem is I have no idea what to call them. Any ideas? One cool thing about these is the graphics are internal so they'll always be visible from the sides and shouldn't wear off. Did you use Mack wheels for those? They look cool. But I don't know what to call them! Unless you like streetspinz!? those are pretty cool. what size wheel bay do they fit? they look wide to me. I'm very curious about how you made them, especially if they're not just two Mack wheels. I was going to custom mill my own plastic parts again for this fourth wheel project of mine, but once I realised mack wheels would be perfect I sourced myself a couple of pairs of new Mack's and saved myself a lot of time. Of course if I wanted to make more, now that I have a couple of prototypes to measure/work from it would be a little easier. If you're talking about the pic, the slightly unusual shape on some people's screens (depending on what res you're running at) might be due to the same reason as for a lot of my pics: I sometimes slightly tweak the aspect ratios of pics I post in an attempt to make better use of limited screen areas, given that I know some people run at lower resolutions than my dual widescreen (3280x1050) set up, but to answer your question: like most of my custom wheels these can be easily set up to fit medium or large mega bays, since that's what my heeling friends and I prefer for typical rough UK street surfaces. On the other hand, if you're talking about the vid, I have kinda small hands so that may make them look big. Of course they're not quite just two mack wheels - took a bit of experimenting to get to this stage. As you can see there are of course four wheels per set (two halves per wheel) and they had to be made to fit a largish mega bay. The bearings are gold ABEC-7 698s (four per shoe to ensure even my heaviest body-builder friends get a smooth ride), and as WC correctly guessed, I'm most impressed (don't mean to rhyme ) the outer wheels are from SMALL macks (US size 3-5, mack wheels generally being larger even than mega's, whilst still having the cool pre-existing Heelys graphics), the axle in the version pictured is for a mega bay of course so they might well look wide, and the spacer is from the intra-bearing spacer of Merlyn-type freespins, so it's a bit of a combination of wheels really, but suprisingly enough it all fits together and works perfectly. Haha, nice, I like it. How did you "source" some mack wheels. Were they even available separately? Did you buy some Macks just for the wheels? Did you have them specially made (no wonder you're poor, that would cost TDM!)? If you feel the need to keep any of this secret... why? It's cool that you're making all these bitchin' wheels, but you're just making a lot of us jealous. Do you have any plans to sell any of your custom wheels? 'cus I know I'd love a set of those. The first time I made a "custom wheel" post I tried to include everything in that first post, which some people thought made the post too long, so this time I just tried to show a quick vid and a pic and leave it at that, but now I see that too won't do, because clearly some people will want to know more, much more, lol. I guess you can never please everyone at all points. Well, OK, I'll try my best to fill in any gaps, but if you want answers you will just have to accept that this is going to mean a long post. I don't want anyone blaming me for that! Q: If you feel the need to keep any of this secret... why? A: Nope, I'm not keeping any secrets about these wheels, my previous uncharacteristically brief posts were just because I have been a little busy and was trying to keep it brief for the sake of the young'uns, but I guess I've blown the "keep it brief" goal now . . . and the only time I ever don't tell you guys something about a new wheel project I am working on, is before it's finished. It's like I said in my first wheel project (the green freespins): I'd hate to shout about something I was going to do, and then disappoint people if I found it couldn't be done (for whatever reason) - I've experienced that online before myself: someone saying they're going to do this or that interesting thing, and I myself remember being a little disappointed when they fail or simply give up, and I don't like to disappoint people, so in general, I don't mention my little projects till they're finished, tested and working. Does that makes sense? As a segue, as I may have mentioned the cost of Heelys here is high compared to what you guys in the US would usually consider reasonable - at least it is in my experience: whenever I tell someone I can get US12 Torches or Rumbles they're happy, but usually when I say it'll cost (say) $120 they run a mile - we brits are used to being ripped off tho, and I think I am addicted to Heelys so I was happy to buy the Macks if it meant I could make real my dream (and seemingly Mav's also ) of getting the ultimate street wheel. Q: Do you have any plans to sell any of your custom wheels? 'cus I know I'd love a set of those. 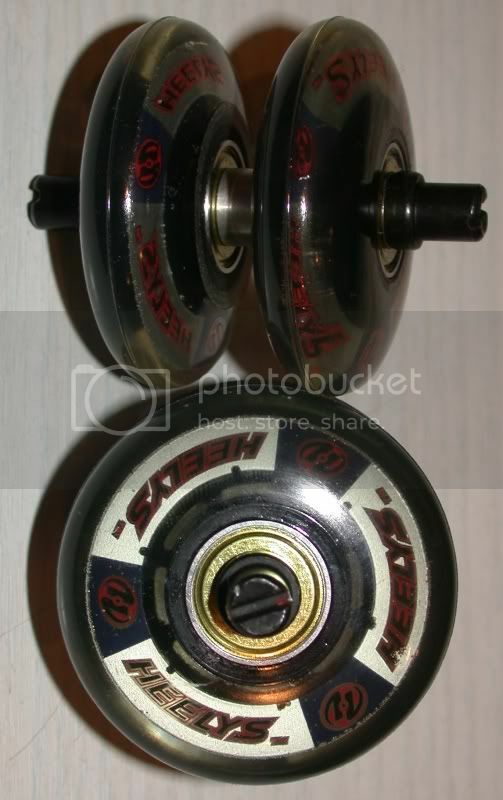 A: Well, to get me through tough times (when I was unable to buy as many pairs of heelys per month as I usually do ) I have made and sold a couple of pairs of custom wheels to friends here in the UK. But obviously since many of my custom projects require quite a few expenses, like buying Macks to nick the wheels off, or paying for access to professional milling or whatever, not to mention all the time and experimenting I put into the finished product, the prices would probably be more than what most people would consider worth paying. But as I said, I really am very keen on Heelys, so yes I do make myself poor with this addiction. So, yes, I have been known to make and sell custom wheels, but even if I do it at no profit at all, the total cost for some like this would probably work out to about $140. If that's ok mate, I can make and send you some? It's cool that you're making all these bitchin' wheels, but you're just making a lot of us jealous. I am sorry if the wheels make you jealous. I guess I should take that as a compliment, but if it's true I do feel a little bad about it: I don't mean to make you jealous, I just wanted to share this crazy consuming interest of mine with the other people I know who might understand it? If anything you shouldn't envy me for the stuff I got, you should pity me for being daft enough to spend so much to get it. One of the reasons I share these kind of ideas is that I figure if people see that it can be done, maybe they will realise they too can do it themselves, and it's always easier to do something the second time with help from someone who's done it once, than to go it alone and figure it all out for yourself. So yeah, I guess I just like to push the boundaries a bit and see what can be done, and share this with people, I don't mean to make you jealous. But if you're jealous of me for making some unique wheels, some of the other Heelers must make you jealous too? I know I myself in the past must admit to being a little jealous. Of hidude/nexiuz for example: for having a cool halfpipe in her back garden for a while, and all that cool street heeling kit (ramps, rails etc). And what about Merlyn: man, he has an entire skatepark of his own to practise in - Dunno about you AMN but I'm green with envy. And then I'm jealous that you guys have so many more heelers and stores that carry them over there. . . and that heelys have been out far longer there etc, and that you have the teams and national practises and. . . . Hehe, maybe I should name these Jealousy Wheels? But mostly I am jealous of people's skill/abillities/balance. I'd love to be able to do the kind of tricks I see Seth or Big Mac doing on a halfpipe - but with me, a little jealousy just makes me try that bit harder to achieve those goals, so I guess jealousy can be a good thing. D'oh! You got me, Merrie. I'm jealous of Merlyn with his freespins, megaverts, and a whole skate park. I'm jealous of the peeps with their back yard half pipes and mad skillz. I'm jealous of Mav and his raw courage to try new things with a "frak you!" attitude the whole time. And I'm jealous of you for your sweet custom wheels. Those are some pretty cool wheels! I'll have to keep my eyes open for a pair of small macks! you could always call them Loony wheels.